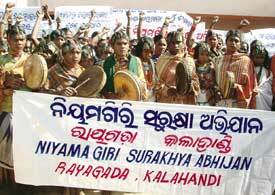 there are rumours that Vedanta Aluminium Ltd has been permitted to mine bauxite in the Niyamgiri hills, Orissa, by the Union ministry of environment and forests (m o ef). The company, with extensive mining interests in India, was earlier enmeshed in a controversy over setting up of an alumina refinery at Lanjigarh village in Kalahandi district. However, none engaged in a court battle with Vedanta over the issue can say for certain how they got permission despite a widely reported study by the Wildlife Institute of India (wii), which warned against the adverse impact of mining. Biswajit Mohanty, Wildlife Society of Orissa secretary, one of the three petitioners in the Supreme Court, is not sure whether Vedanta was cleared by moef. Aparti Mallick, under secretary, state steel and mines department, also pleaded complete ignorance. The total mine lease area involved is 721.323 ha including 672.018 ha of forested land in Rayagada and Kalahandi (south) forest divisions. Vedanta officials remain tightlipped. "We cannot speak on this at present since the matter is sub judice," says company spokesperson, Prakash Mirpuri. There is speculation that the report compiled by wii scientists, Sushant Chowdhury and Bivash Pandav, following a visit to Niyamgiri in May this year has been tampered with. The original report say that mining will result in adverse changes in the geomorphology of the area and enhance several other consequences leading to soil erosion and impact on drainage and forest productivity. The report also warns against the fallout of blasting and night-time mining on wildlife. It points out that this could reduce elephant movement across the Niyamgiri massif to Karlapath and Kotagarh wildlife sanctuaries and affect its population and genetic diversity. The presence of people at the mining site will also enhance the possibility of man-animal conflicts. More importantly, the cost benefit ratio projected for the mining project is 1:4.3 which does not account for non-use value of the forests. "This cost benefit value should not only take into account the material benefits of bauxite ore mining over a period of 26 years but should take into account the perpetuity of the resources and ecosystem services that would be provided by these forests in the future. Compromising long term economic return therefore cannot be an alternative for short term gains," caution the scientists. With allegations of tampering rife, the issue of mining has become more controversial. However, neither wii director, P R Sinha nor the two scientists were available for comments.